The case begins for Athens' Chief Inspector Andreas Kaldis with a literal bang when a corrupt former police colonel who runs a protection racket on Mykonos is gunned down. Suddenly, Athens' Chief Inspector Andreas Kaldis is face-to-face with Greece's top crime bosses on an island whose natural beauty and reputation as an international playground belies the corruption lurking just beneath the surface. Jeffrey Siger was born and raised in Pittsburgh, Pennsylvania, practiced law at a major Wall Street law firm, and later established his own New York City law firm where he continued as one of its name partners until giving it all up to write full-time among the people, life, and politics of his beloved Mykonos. 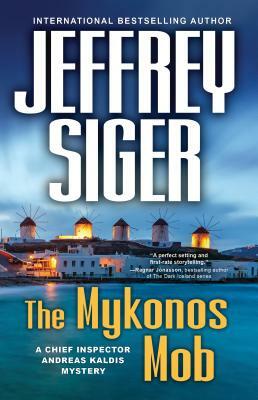 The Mykonos Mob is the tenth novel in his internationally best-selling and award nominated Chief Inspector Andreas Kaldis series, following up on An Aegean April, Santorini Caesars, Devil in Delphi, Sons of Sparta, Mykonos After Midnight, Target: Tinos, Prey on Patmos, Assassins of Athens, and Murder in Mykonos.The New York Times described Jeffrey Siger's novels as "thoughtful police procedurals set in picturesque but not untroubled Greek locales," and named him as Greece's thriller writer of record. The Greek Press called his work "prophetic," Eurocrime described him as a "very gifted American author...on a par with other American authors such as Joseph Wambaugh or Ed McBain," and the City of San Francisco awarded him its Certificate of Honor citing that his "acclaimed books have not only explored modern Greek society and its ancient roots but have inspired political change in Greece." He now lives in Greece.